A Girl swoons over Brussels sprouts and has them on permanent repeat in her kitchen. Especially, ones that are crispy and crunchy served with lemon juice! It is the most simple and delicious preparation for this vegetable. Brussels sprouts are a perfect side because they go with anything. Heat the olive oil in a large skillet over medium high heat. Place Brussels sprouts in a single layer with cut side down. Cook for about 6-8 minutes allowing them to brown, not burn. Keep an eye on them because time and heat control is vital. If needed, add some water to help simmer and saute. Toss and stir them and flip them to let the other side brown for an additional 4-5 minutes. 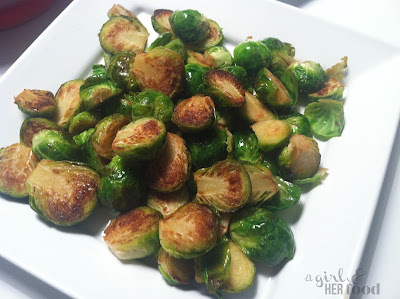 Sprinkle with sea salt and squeeze the lemon over the Brussels sprouts and serve!